Above Corey Grosenbach addresses a crowd at his store Tuesday night. 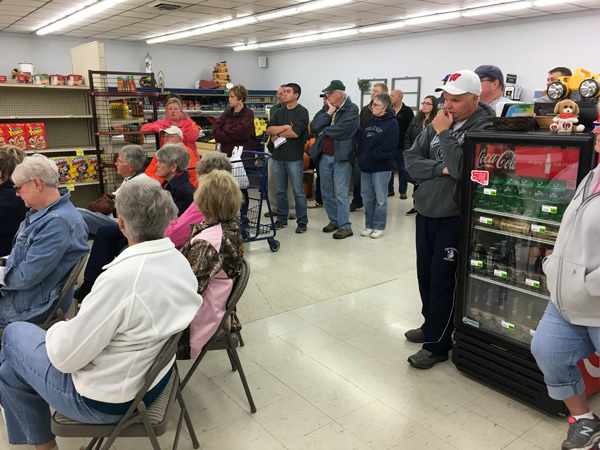 A crowd of around 50 people showed up at Grosenbach's Grocery Tuesday night to listen to owner Corey Grosenbach's discuss the situation at the store. 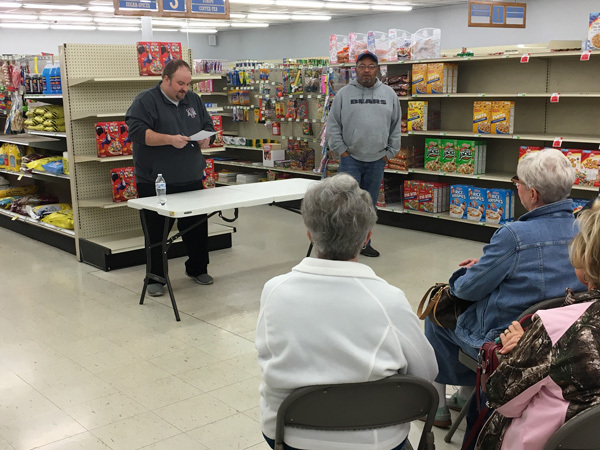 Mr. Grosenbach said the meeting was to discuss the store's ups and downs and to get feedback from the community on how to improve service and sales. Mr. Grosenbach said we love being here and plan on being here for a very long time. He emphasized that the store will not be closing. He said when the store first opened they had great sales and wants to get back to that. He said they had great success with their ads at first but soon realized they couldn't keep giving a product away at a loss or a very low markup. However, he said he did want to start weekly ads again. He emphasized that being low on stock does not mean the store is going out of business. Within the first 2 and one half years the store had 7 cooler and freezer repairs, one compressor needed to be totally rebuilt and many other maintenance repairs were needed. He said the City of Minonk was kind enough to help with the expenses but the expensive repairs took away from their inventory. Mr. Grosenbach said with 2200 people in town and 3000 in the area he is hoping to have a customer count of 1800 people who will spend $17 to $20 per week at the store. By meeting this goal all the bills could be paid easily and have funds for emergency fixes, weekly ads and add hours and employees back in. Right now the store is at about half of that goal. He said the store's supplier is great and specializes in family run stores. Mr. Grosenbach emphasized they always try to keep the meat and produce department full and fresh. When the customer count slips, the meat and produce sales slip and the profit goes into the trash can. He said the elderly in town who can't drive out of town are dependent on the store. He said he knows they can't compete with the big stores and many people who work out of town do their shopping there also. But he asked people to remember that $20 for my home town. He said his feedback from the community indicates they want earlier opening hours, possibly 7:30 am and also expanding the deli menu. He also mentioned starting a curbside service. The assembled crowd then offered suggestions. Christy Ruestman suggested that the store emphasize the stock items that most people want and maybe do away with less popular items such as dog or cat food. Russell Ruestman said he didn't think most people who shop in Minonk are that price conscious and will shop in Minonk because of its convenience and if the item is available. Someone else suggested combining orders with other stores serviced by the same supplier. Above a crowd of around 50 people showed up for the meeting. Dave Uphoff said he would be glad to put weekly specials prepared by Mr. Grosenbach on the MinonkTalk website as a replacement for the expensive colored ads he used to distribute. Mr. Uphoff also emphasized the importance of keeping basic items such as cheese, flour, bread,. etc. in stock because if someone can't find a staple item they will often not return to the store. Mr. Grosenbach mentioned he is taking over a convenience store in McNabb, IL and said it represents a great opportunity as the store has gaming machines which will bring in money. This remark caused someone to ask Mr. Grosenbach if is going to be in the store more often. He replied that he has been awfully busy lately getting the McNabb store ready and also was recently married. Kevin Persic: Seriously? Since I moved to El paso and shop at IGA for its convenience, I find it sad how many people from Minonk drive to El paso to shop. I have seen businessmen from Minonk on several occasions. It is hard to hear the whole "support your hometown," bit when you see such things. Use it or lose it people. Sherry Alpiser" After I drop the kids off at school I have been there at 8 am at least 3 times before the hours changed and they were not open. Dollar General ended up getting the monies.